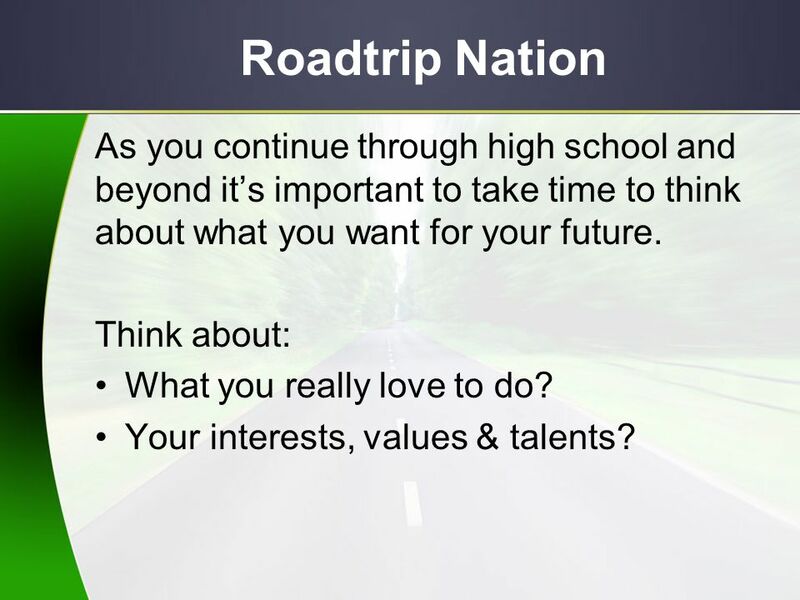 2 Roadtrip Nation As you continue through high school and beyond it’s important to take time to think about what you want for your future. Think about: What you really love to do? Your interests, values & talents? 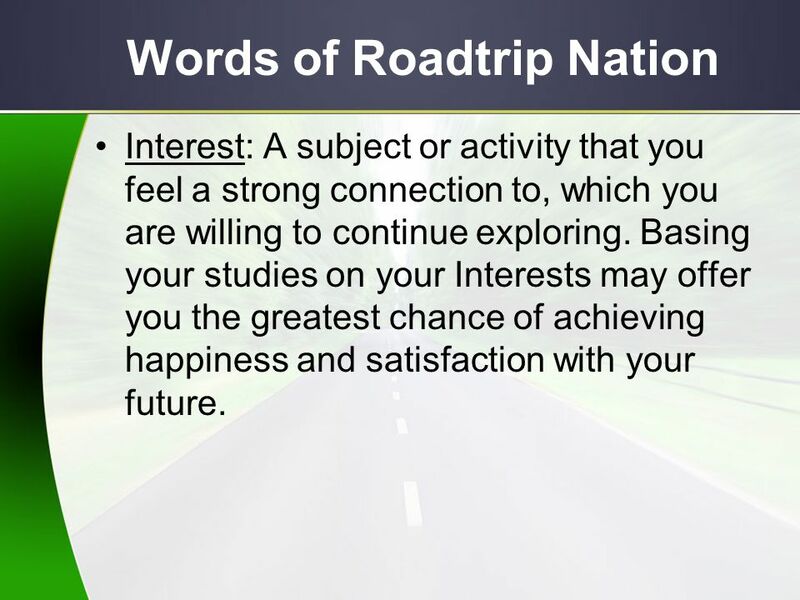 Roadtrip: A life-changing journey; to define your own Road and pursue your interests in life by seeking advice from others and looking inside yourself to figure our what your are truly passionate about. 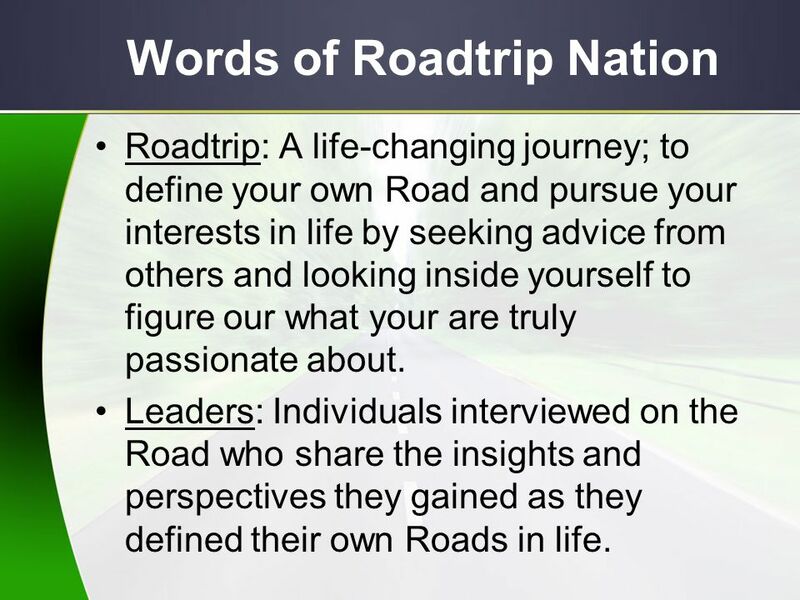 Leaders: Individuals interviewed on the Road who share the insights and perspectives they gained as they defined their own Roads in life. The Noise: The views of society- including family, friends, or strangers-that often influence what you thing you should do with your life. It’s a constant process to filter The Noise and focus on what matters most to you. 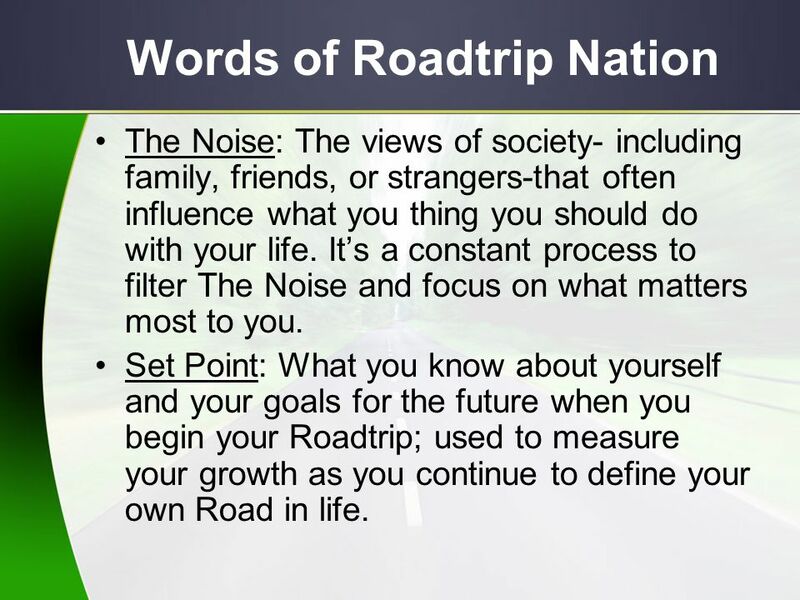 Set Point: What you know about yourself and your goals for the future when you begin your Roadtrip; used to measure your growth as you continue to define your own Road in life. 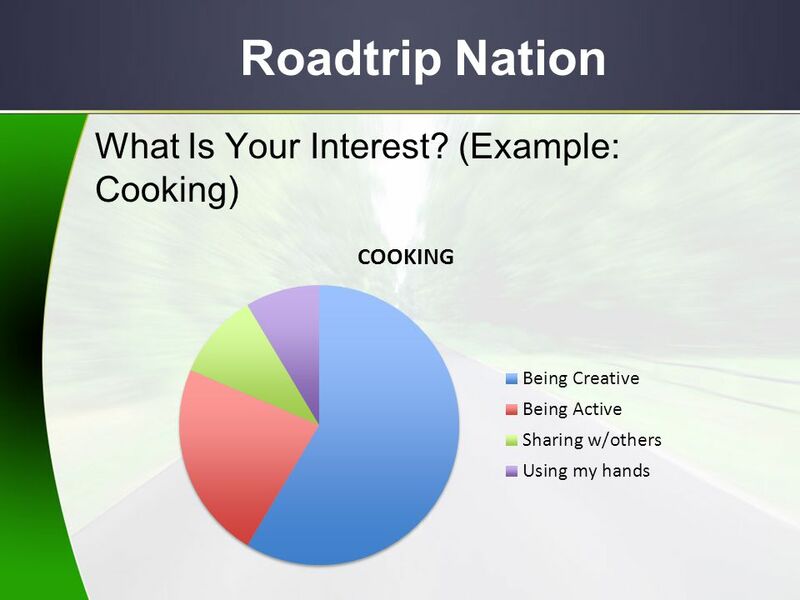 Interest: A subject or activity that you feel a strong connection to, which you are willing to continue exploring. Basing your studies on your Interests may offer you the greatest chance of achieving happiness and satisfaction with your future. 6 Roadtrip Nation Video: "Red Rubber Ball" Think about it…. What is your “red rubber ball”? 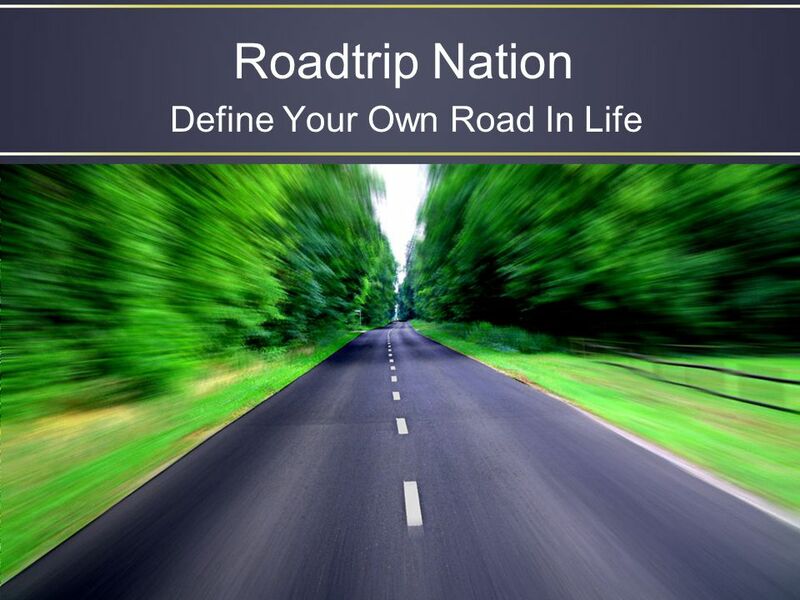 Download ppt "Define Your Own Road In Life"
It’s Your Life – Go For It! Tactical Leadership Tanesha Parker October 10 th, 2010. Explore Career and Postsecondary Options 11th Grade Do What You Are #4. M4L 2013 Lesson 6 How can I find happiness when things don't go my way? © Paul T. P. Wong, Ph.D., C. Psych. Theme What it is And What it isn’t. What is a theme? The theme IS the stories BIG idea. The theme IS the lesson learned or the moral. The theme IS the. Tuesdays with Morrie by Mitch Albom an old man a young man life’s greatest lesson. Tarot and Other Psychic Studies Home Courses and other pages, contact me etc Readings * Mediumship * Tarot - readings can include clairvoyance, palm reading. Student Teaching Completion Interview Shannon Barnson. Chapter 12: Preparing Your Future. Careers Now! Societal Changes Societal Changes Economic Changes Economic Changes Ability to change jobs Ability to. How Can I Use It? 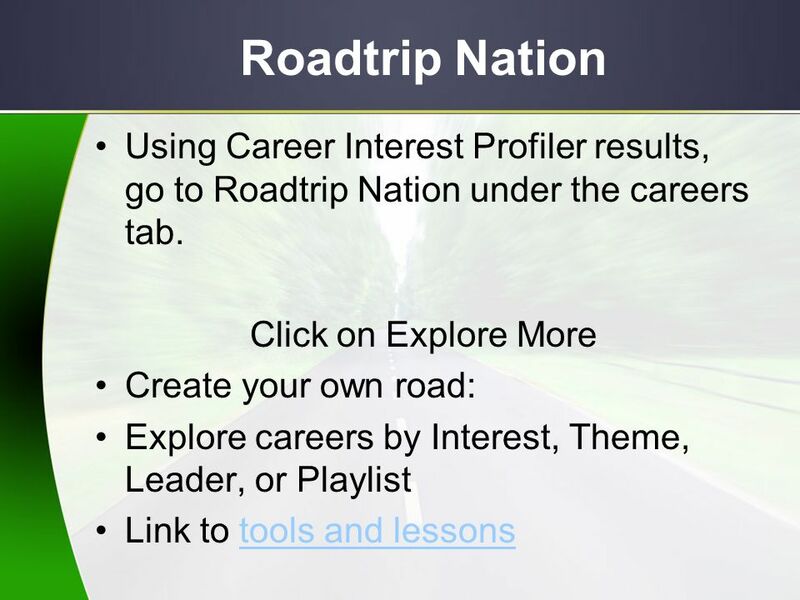 Career Planning –Career Interest Profiler, Personality Inventory, Career Cluster Finder, Resume Building College Planning –College. PERSONAL MISSION STATEMENT. What is it? Writing a personal mission statement offers the opportunity to establish what's important and perhaps make a decision. Habit 2: Begin with the End in Mind 1. Personal Leadership Identify the core values that guide you. Visualize what you want to achieve in life. Determine. Before you swipe right… and other relationship advice Jen Zarate Ball State University. What Do Colleges Want? How to Write a Winning College Application Essay. The Art of Managing Career Transitions Katarina Holm-DiDio GlobalSkillsforLifeandWork.com. The Road to Success – Starting Your Business Hartley McGrathSusan TadieJustin Ribeiro.